"Mexican America" and "Mexican Empire (1821–1823)" redirect here. For the professional wrestling stable, see Mexican America (professional wrestling). For other political entities, see Mexican Empire. 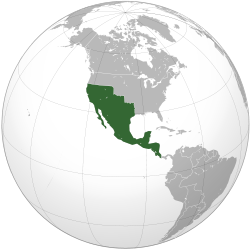 The Mexican Empire (Spanish: Imperio Mexicano, pronounced [ĩmˈpeɾjo mexiˈcano]) was a short-lived monarchy, and the first independent post-colonial imperial state in Mexico. It was the only former colony of the Spanish Empire to establish a monarchy after independence. Together with the Brazilian Empire and the two Haitian Empires, it was one of four European-style empires in the Americas; it lasted two years before transitioning into a federal republic. It existed from the signing of the Treaty of Córdoba and the declaration of Independence of the Mexican Empire in September 1821 until the emperor's abdication in March 1823 when the Provisional Government took power and the First Mexican Republic was proclaimed in 1824. The first monarch of the state was Agustín de Iturbide, reigning as Agustín I of Mexico. The various independentist factions in revolutionary Mexico coalesced around three principles, or "guarantees," for Mexican independence from Spain: that Mexico would be an independent constitutional monarchy governed by a conservative European prince; that criollos and peninsulares would henceforth enjoy equal rights and privileges; and that the Roman Catholic Church would retain its privileges and position as the official religion of the land. These Three Guarantees formed the core of the Plan of Iguala, the revolutionary blueprint which, by combining the goal of independence and a constitution with the preservation of Catholic monarchy, brought together all Mexican factions. Under the 24 February 1821 Plan of Iguala, to which most of the provinces subscribed, the Mexican Congress established a regency council which was headed by Iturbide. After signing the Declaration of Independence of the Mexican Empire of 28 September 1821, the Mexican Congress intended to establish a commonwealth whereby the King of Spain, Ferdinand VII, would also be emperor of Mexico, and both countries would be governed by separate laws and form separate legislative bodies. If the king refused the position, the law provided for another member of the House of Bourbon to accede to the Mexican throne. However, the goal was merely a political tactic to appease the last royalists, and full independence was expected. King Ferdinand, however, refused to recognize Mexico's independence and said that Spain would not allow any other European prince to take the throne of Mexico. Art 1 °. The Mexican Monarchy, in addition to being moderate and Constitutional, is also hereditary. Art 2 °. Consequently, the Nation calls the succession of the Crown for the death of the current Emperor, his firstborn son Don Agustín Jerónimo de Iturbide. The Constitution of the Empire will decide the order of succession of the throne. Art 3 °. The crown prince will be called "Prince Imperial" and will have the treatment of Imperial Highness. Art 4 °. The legitimate sons and daughters of H.I.M will be called "Mexican Princes", and will have the treatment of Highness. Art 5 °. Don José Joaquín de Iturbide y Arreguí, Father of H.I.M, is decorated with the title of "Prince of the Union" and the treatment of Highness, during his life. Art 6 °. It is also granted the title of "Princess of Iturbide" and the treatment of Highness, during his life, to Doña María Nicolasa de Iturbide y Arámburo, sister of the Emperor. General Agustín de Iturbide, a Mexican criollo who had been a royalist officer and who had led the Army of the Three Guarantees in the final phases of the war, was elected head of the provisional government and of the regency which held the imperial power while a monarch was chosen. Iturbide was extremely popular after his successes in the war of independence, and in the evening of 18 May 1822 a mass demonstration led by the Regiment of Celaya, which Iturbide had commanded during the war, marched through the streets of Mexico City and demanded that their commander-in-chief accept the throne himself. On 19 May 1822, Mexican Congress named Iturbide as a constitutional emperor. On 21 May it issued a decree confirming this appointment, which was officially a temporary measure until a European monarch could be found to rule Mexico. Iturbide's official title was, "By Divine Providence and the National Congress, First Constitutional Emperor of Mexico" (Spanish: Por la Divina Providencia y por el Congreso de la Nación, Primer Emperador Constitucional de México). His coronation took place on 21 July 1822 in Mexico City. In August 1822 a plot to overthrow the monarchy was discovered and on August 25, plotters, including 16 members of Congress, were arrested. As factions in the Congress began to sharply criticise Iturbide and his policies, the emperor decided on 31 October to dissolve the body. This led to provincial uprisings, the most important of which was in the garrison at Veracruz led by Antonio López de Santa Anna, who would later be president of Mexico during the secession of Texas and the disastrous Mexican–American War. Santa Anna and his troops revolted against Iturbide, calling for the restoration of the Congress on 1 December 1822. Santa Anna had secretly persuaded General Echávarri, the commander of the Imperial forces, to switch sides and support the revolution when it was ready to be proclaimed throughout Mexico. The independence heroes Vicente Guerrero, Nicolás Bravo and Guadalupe Victoria soon joined, signing the Plan of Casa Mata on February 1, 1823, which called for the restoration of the Congress. The Plan of Casa Mata, which other Mexican generals, governors, and high-ranking governmental officials soon signed, did not recognize the First Mexican Empire and called for the convening of a new Constituent Congress. The insurrectionists sent their proposal to the provincial governments and requested their adherence to the plan. In the course of just six weeks, the Plan of Casa Mata traveled to such remote places as Texas, and almost all the provinces supported the plan. Each provincial government that accepted the plan thereby withdrew its allegiance from the Imperial government and assumed sovereignty within its own province. This left Emperor Agustín I isolated with little support outside of Mexico City and a few factions of the Imperial Army. Consequently, he reinstalled the Congress, which he had previously abolished, abdicated the throne, and fled the country on 19 March 1823. Santa Anna and the other proponents of the Plan of Casa Mata went on to oversee the drafting of a new constitution and the establishment of the First Mexican Republic the following year. The territory of the Mexican Empire corresponded to the borders of Viceroyalty of New Spain, excluding the Captaincies General of Cuba, Santo Domingo and the Philippines. The Central American lands of the former Captaincy General of Guatemala were annexed to the Empire shortly after its establishment, making the First Mexican Empire the largest country in North America with territory of approximately 5 million square km. 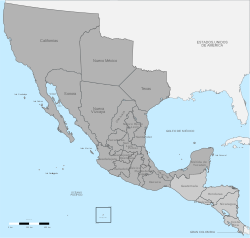 Under the First Empire, Mexico reached its greatest territorial extent, stretching from northern California to the provinces of Central America (excluding Panama, which was then part of Colombia), which had not initially approved becoming part of the Mexican Empire but joined the Empire shortly after their independence. After the emperor abdicated, on March 29 the departing Mexican general Vicente Filisola called for a new Central American Congress to convene and on July 1, 1823 the Central American provinces formed the Federal Republic of Central America, with only the province of Chiapas choosing to remain a part of Mexico as a state. Subsequent territorial evolution of Mexico over the next several decades (principally cessions to the United States) would eventually reduce Mexico to less than half its maximum extent. ^ "Primer Imperio Mexicano". La Guía. Retrieved 28 October 2014. ^ Michael S. Werner (2001). Concise Encyclopedia of Mexico. Taylor & Francis. pp. 308–9. ^ Christon I. Archer (2007). The Birth of Modern Mexico, 1780–1824. Rowman & Littlefield. p. 220. ^ Quirarte, Martín (1978). Visión Panorámica de la Historia de México (11th ed.). Mexico: Librería Porrúa Hnos. Anna, Timothy. The Mexican Empire of Iturbide. Lincoln: University of Nebraska Press 1990. Benson, Nettie Lee. "The Plan of Casa Mata" Hispanic American Historical Review. 25 (February 1945) pp. 45–56. Calderón Quijano, José Antonio. Los Virreyes de Nueva España durante el reinado de Carlos III. Sevilla, 1967–1968. Ramos Pérez, Demetrio et al. América en el siglo XVII. Madrid: Rialp, 1982–1989. Ramos Pérez, Demetrio et al. América en el siglo XVIII. Madrid: Rialp, 1982–1989. Richmond, Douglas W. "Agustín de Iturbide" in Encyclopedia of Mexico. Chicago: Fitzroy Dearborn 1997, pp. 711–713. Robertson, William Spence. Iturbide of Mexico. Durham: Duke University Press 1952. Rubio Mañé, Ignacio. Introducción al estudio de los virreyes de Nueva España, 1535–1746. Mexico City, 2nd ed., 1983.